Catfish are farmed sustainably in the United States and offer a fantastic versatile white fillet that adapts well to almost any cooking style. It is a culinary and aquaculture success that will greatly benefit your menu and please your customers with numerous delicious recipes. Consistently mild and sweet, the catfish has an unusual texture that is firmer and less flaky than other finfish. It has extreme culinary versatility and your chef may choose to dress your catfish with complex seasonings and sauces or don fillets with simple herbs and butter. Catfish is complimented by a wide range of flavorings, whether mild or strong and can be prepared baked, broiled, fried, grilled, sautéed – the opportunities are limitless! Supplement your menu with catfish in a number of interesting entrées and your diners will quickly add it to their favorite seafood list. Catfish farmed in the U.S. are considered one of the most sustainable fish species available. Most farms are found on the Mississippi Delta with some production in Alabama, Arkansas and Louisiana. They are farmed in closed, recirculating freshwater ponds that prevent any waste pollution or invasive species spread. Their diet is highly efficient and relies on soybeans, corn and rice rather than the less environmentally friendly fishmeal and fish oil alternatives. 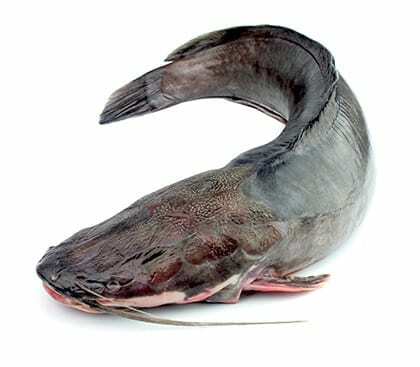 The Food and Drug Administration regulates farming and catfish are one of the most quality-controlled products in the food industry. These factors have combined to create one of America’s most popular seafood items. We guarantee that you and your customers will be satisfied with our high quality seafood products. The team at Pucci Foods strives to provide Bay Area businesses and residents with the safest, freshest and most sustainable seafood on the market. Enjoy our wholesale catfish and know that you are supporting environmentally friendly practices. Order wholesale catfish by completing the form on this page and a member of our team will contact you soon.